UFO SIGHTINGS DAILY: Green Alien Walking On Post Office Roof Witnessed By Stephenville Police Officer, UFO Sighting News. 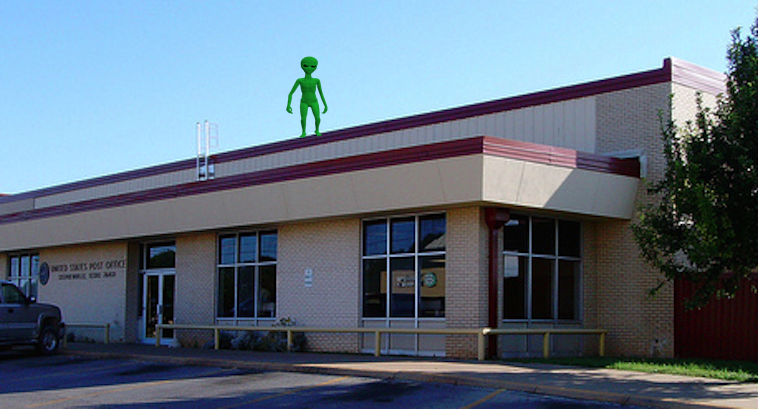 Green Alien Walking On Post Office Roof Witnessed By Stephenville Police Officer, UFO Sighting News. Photo recreation above, actual post office in Stephenville. Here is a police officer report about him seeing a green glowing alien walking on the roof of the Stephenville post office. He held back this info until he was retired, which was probably a good idea, since his lively hood was at stake. Stephenville is also home of one of the move recent and mass sightings in the last 10 years...where a 300 meter rectangle UFO flew slowly over the city toward the US president Bush ranch...Bush was in office at the time, and its my personal belief that this UFO was piloted by Pres Bush himself since he has piloted other Navy jets and is a bit of a wild card...sky diving every year. So, if Bush found out about a secret gov project or alien base with a 300 meter UFO in it, what do you think would be the first think to cross his mind...thats right....I want to fly that thing! And nothing in hell or high would dare say no to that cowboy president. Back in 2000 -2001 I was employed at the Police department as the patrol night shift Sergeant with the Police Department,My shift was from 7pm - 7am. On this particular night,I had been at the police department for a short break.I walked out to my patrol car and left heading east. I drove one block over and noticed something on top of the post office that caught my attention.I stopped my patrol vehicle in the street between two vacant parking lots. The post office was located one block to my north of my position. This was a cloudless night and very clear. My driver side window was down and was in direct line and view of what I was observing.I first saw something light green getting larger as it was heading across the roof of the post office toward my direction. As I watched it, I began to realize it appeared to exactly resemble a person walking. It stopped at the edge of the flat roof of the post office on the side facing me and stopped. The best description I can give of the thing I saw is the following: It appeared to be about 8 foot tall. I base this by the height of the post office wall in porportion to the things height. The body of the thing had a regular build to its height,meaning what a person who have who was in good shape. Not fat or skinny. The most extrodinary item was the thing was transparent. The lines of the thing were flourecent green with gave it somewhat of a mass but was still transparent.The thing had great 3D detail. Every feature except for the height appreared to be human. The clothing appeared to be what I would describe as a jumpsuit. But again, it was all one color and made up by its green outlines.The thing appreared bald to the best of what I remember. The thing stood at the edge and put its hands on its hips and turned its upper body a began looking back off to the west as if it was observing something. It then turned and began looking off to the east for a few seconds. All I could think was that I cant believe what Im seeing and I hope it didnt see me. A few seconds later it looked down directly at me. I didnt feel fear. I dont know if I could actually see a smile or just had that feeling like it was smiling and saying, "Well you saw me." I never felt threatened. The thing turned and began walking back the way it came. I remember saying to myself, like hell your getting away. I drove to the back side of the post office (North side). The walls to the post office are about 25 foot tall on all sides. I knew it couldnt jump down. I called the fire departemnt which is located next to the police station and told them to bring a ladder truck over to the post office because I believed someone was on the roof. Another police unit left the police department and set up watching the opposite sides of the building.About 5 minutes later the fire department arrived. I told the others to stay down and I would check the roof. I climbed up on the roof and there was nothing. I searched the spot on the roof where it was standing and the path it walked and found nothing. I believ the roof was graveled but cant remember for sure. The officer and fire department personell Im sure thought I was nuts thinking someone was up there. I dared not tell them what I saw. So I sat on this for years and only told a few close friends about the experience. Since the internet has come out I have tried to research any other sightings such as this but have found nothing.I can say this with the utmost confidence. I know what I saw. There was too much detail in the thing. This was a very clear night. The thing had the dark sky behind it so it was easy to see, not to mention its size. I have been retired from the PD for 4 years now. I run my own business and do Private Investigations and Security Contracts. If you have had any other reports like this I would GREATLY appreciate a response. This has bothered me for years and I just would like to know what yall think I saw or what it could have been. Thanks in advance! If you need an exact time and date the police department should have made a call report on the incident.The month and day above are just a guess. I cant remember. But the year should be close.